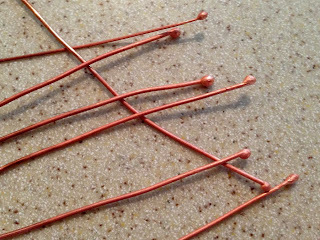 When I did my first post on making copper ball headpins, I was only able to form the ball with thinner (higher gauge) wires. I don't even think I was able to get it to ball up with 20g wire. Luckily, some really helpful people commented on the post and suggested that I try making them a little differently. And it works! 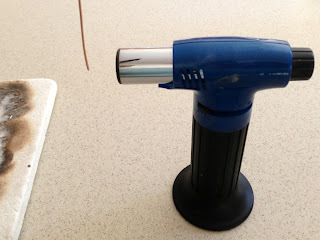 Just to catch you up, what I am talking about here is making headpins with a ball end using copper wire and a butane torch - the type that you use for creme brulee. Normally, I hold the wire perpendicular to the flame and let the ball climb up the wire. But some of the people who left comments suggested that I could get a ball headpin with heavier (lower gauge) wire if I held the wire parallel with the flame. At first, I thought that would mean my hand would be closer to the flame, but it really isn't very different. As you can see, I use some long needle nosed pliers to do this. And the amazing thing is how well it works!! 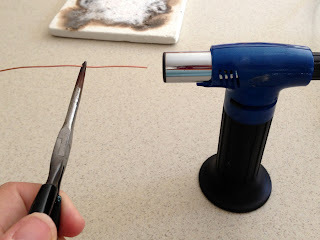 The force of the flame seems to push the end of the wire to melt, and not only was I able to ball 16g wire, but I was able to get some pretty good sized balls on the end. The picture above shows a variety of headpins that were made using 16g to 20g wire. Thank you for your comments and help!! Cool, thanks for posting. 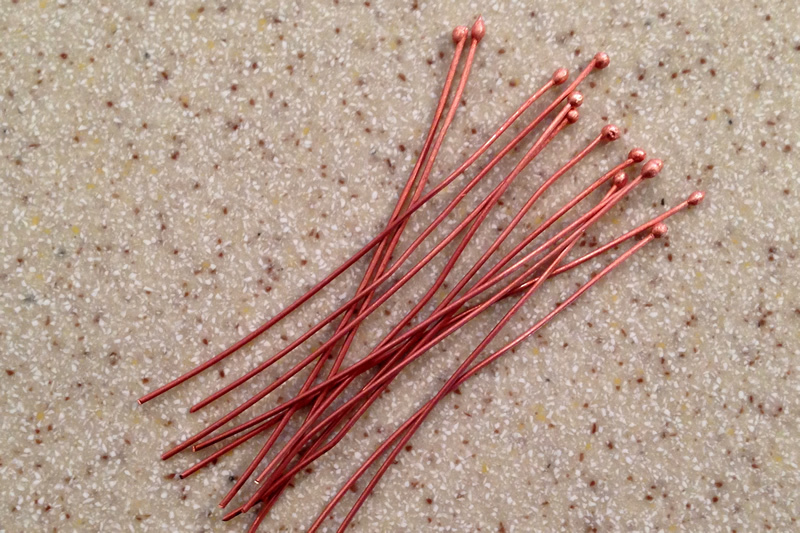 I've been wanting to try making my own headpins, but haven't had time and then wasn't sure how to do it. Can't wait to try this. It also includes information on how to make your own pickle solution without using harsh chemicals. Enjoy!! I love using my torch. I think mine are textured looking too, so I know what you mean. In my experience, only headpins made with fine silver come out perfectly smooth and round. Since I use copper for more 'rustic' style jewelry, it is not as big a concern. If you were careful, you may be able to buff the balls to be a little smoother, but I'm not sure it would be worth the effort. You are such a life saver Lisa! I have just spent an hour trying to ball up 20g & 18 g copper wire with no success. Now after finding your post, I tried 18g & 16g - Voila! Succuss! Thank you! I feel ya - I went through the same thing. So glad I could help! Thank you for the help. I experienced the same thing with the higher gage copper wire working just fine but not being able to do anything with the 16-20 gage. Sterling silver was a lot easier. Hi Lisa, I've tried this before too. Today with success. Sooo exciting. I've made some longer and balled both ends for some rustic wraps Thanks for the tips. Thanks so much for sharing this with us. It is extremely helpful. Thanks for sharing, I've tried to do this with no luck, I'll try again.